As a professional organizer, I love a gorgeous magazine-worthy organized photo or space as much as the next person. But I’m also aware that not everyone has the budget for all new organizing bins and tools. I’m also personally concerned about the environmental impact of over-consumerism. I’ve found that using repurposed and upcycled items to organize work just as well and can be just as beautiful as store bought items. 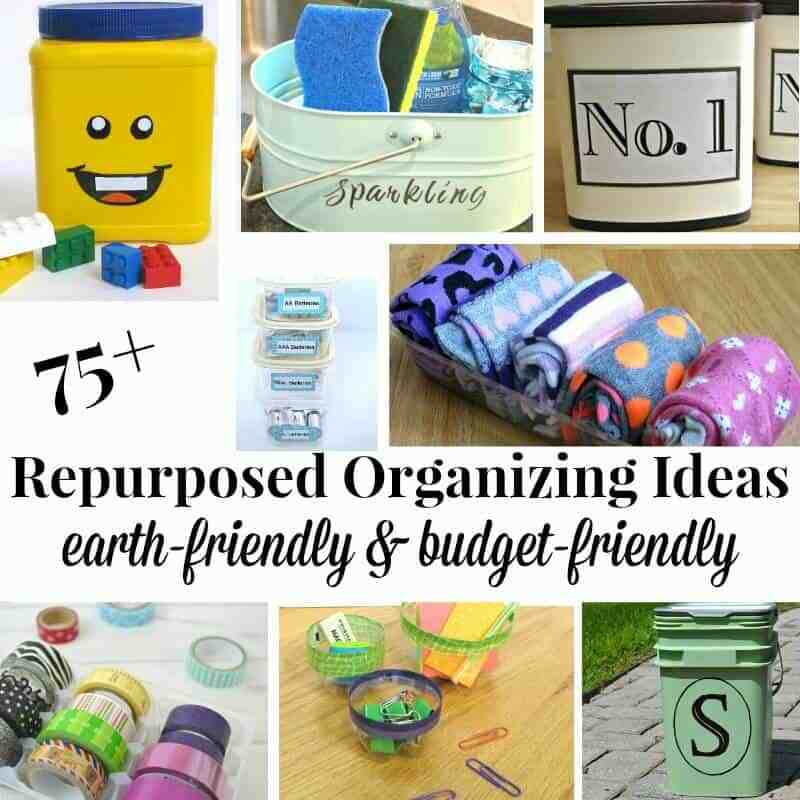 Here are more than 75 free and low-cost repurposed organizing ideas using upcycled and repurposed items that are just as effective and pretty, plus are budget & earth-friendly. Stylish Organizing Bins – Two upcycled items work together to create an easy-to-make decorative organizing bin. How to Pack Christmas Decorations for Free – Repurposed packaging is perfect to safely organize and pack your Christmas decorations. Upcycled Skirt to Zippered Pouch – Zippered pouches are perfect for a multitude of organizing needs. You can make your own from an upcycled skirt or other clothing item. Organizing with Repurposed Packaging – Once you start looking there’s product packaging everywhere that is perfect for organizing. 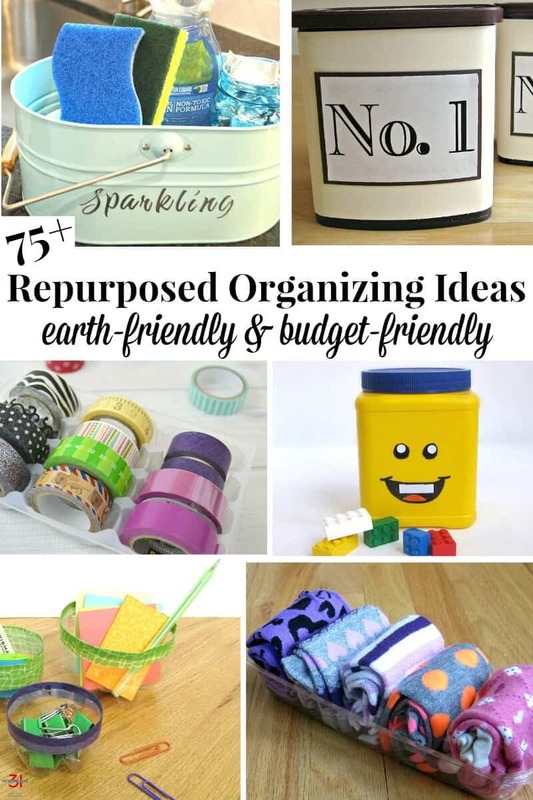 Personalized Repurposed Tin Can – You can easily personalize a can for storage. This is a great project for someone with a unique name. Grab n’ Go Outdoors Kit – The perfect idea for a busy family so you don’t forget those important outdoors supplies. DIY Keepsake Box – Create a personalized box to store memorabilia and keepsakes. Organize Pet Supplies for Dogs – Those zippered pouches that dog treats come in never stay closed and always fall over in the cabinet. Here’s a simple upcycled way to keep dog treats fresh and organized. Repurposed Cocoa Cans – It’s simple to create graphic organizing cans in just minutes. Repurposed Cleaning Caddy – Create a cleaning caddy from an upcycled bottle to make it easy carry your cleaning supplies from room to room. All-American Upcycled Can – Create patriotic storage for a holiday or everyday organization. Repurposed Portable Wrapping Station – Repurpose a simple IKEA item to create a wrapping station that is simple to move from room to room. Repurposed Breakfast Box – You can upcycle a plastic breakfast can into a first aid kit for just pennies. And it’s cute, too. Repurposed Sweater Sleeve Travel Bag – Travel bags for your shoes keeps your suitcase clean, neat and organized. Repurposed Cloth Napkin Box – Cloth napkins make adorable boxes and bins for organizing drawers or shelves. Decoupage Storage Box – A shopping bag from your favorite store, a box and a bit of decoupage glue creates a personalized organizing bin. DIY Pool Storage – Uses for Empty Cat Litter Container – Everyone knows that plastic kitty litter bins are perfect for storage. This simple trick makes them stylish looking, too. Repurposed Mentos Bottle – What can you organize with a small plastic bottle? Repurposed Bottle into Key Holder – Have you ever been late leaving home because you can’t find your keys? It’s simple to turn a plastic bottle into a key holder so you’ll always be able to find them. Organize Your Car with a Repurposed Plastic Can – Cars can quickly become a cluttered mess. A simple plastic can used to corral items is an organizing solution. DIY On-the-Go Sunscreen Kit – If you have a busy family that spends time outdoors, you want to have an on-the-go sunscreen kit. You can make your own with a repurposed container in just a minute. Free Bathroom Organization Ideas – Keep your bathroom organized with these free upcycled ideas. Recycled Ideas for Bathroom Organization – Recycled items to the rescue for bathroom organization. Repurposed Snack Jar – A plastic snack container is the perfect bathroom organizing container. Easy Upcycled Bucket for Bathroom Organization – Two little buckets from the thrift store provide festive bathroom organizing. Dish Cleaning Caddy – Create your own dish cleaning caddy with from this repurposed item that you can often find in thrift stores. Trail Mix Labels – Make Your Own – Create your own personalized labels for repurposed glass jars in your pantry. Organizing Kitchen Drawers for Free – No more mess greeting you when you open a kitchen drawer. Organize Under the Kitchen Sink for Free – You really can organize under your kitchen sink for free when you use repurposed items. Organize Your Kitchen for Free with Repurposed Items – Organize your entire kitchen with repurposed items. You just have to start looking at things headed for the recycle bin or the trash with new eyes. Free Tips for an Organized Kitchen – Organize your kitchen for free with these tips and repurposed ideas. Eco-Friendly Battery Storage – Are your batteries in a pile or rolling around in a drawer? It’s simple to organize them when you use repurposed containers that were headed for the recycle bin. Organizing My Kitchen with Repurposed Packaging – You’ll look at product packaging with new eyes and see new ways to use it to organize your kitchen and home. Spring Organizing Tea with Repurposed Packaging – Several different ideas to organize tea, all using repurposed items. Organize Your Kitchen for Free with Repurposed Items – Another look at ways to organize your kitchen with repurposed items. 5 Free Tips for an Organized Refrigerator – You can easily tidy up your refrigerator for free with repurposed items. Organizing Necklaces – Organizing necklaces and keeping them easily accessible is a snap with this simple upcycled project. Organize Socks with a Repurposed Sandwich Box – No need to purchase drawer organizer when you can repurposed a plastic sandwich box and save it from the landfill. Repurposed Earring Holder – This repurposed earring holder is both a work of art displaying your earrings and a great way to organize them. Easy Shoe Storage – This shoe storage idea is perfect for college students or those living in a small apartment or home. Organizing and Packing Jewelry for Travel – This surprise repurpose works perfectly for organizing jewelry for travel. No Cost Fix for Storing Boots – You don’t have to spend a penny to keep your boots from flopping over in the closet. Simple Solution Organizing Scarves – Not a penny spent and your scarves will be organized beautifully. Organizing Necklaces – A simple repurposed organizing idea that is perfect for rentals. Repurposed Cheese Grater Earring Holder – A fun and surprising way to organize earrings. DIY Clothes Storage Box – This clothes storage idea is perfect for college students or people who move frequently. Free Back-to-School Organization – Keep your child’s school supplies organized so that they can focus on learning and homework. Back-to-School Organizer for School Supplies – You won’t believe what box was repurposed to create this desk organizer. Upcycled Comic Book Can – An hour of crafting with your child creates a fun organizing bin for toys and trinkets. DIY Repurposed Can LEGO Head – No need to buy those expensive LEGO organizing bins. You can make your own with an upcycled container. Upcycled Comic Book Clementine Crate – A fun craft project to create with the kids and you have a cool organizing bin for books or toys. Organized Lunchbox Drawer – Organize the lunch box drawer with repurposed items and your school mornings will be a breeze. Organize Clothes for Back-to-School – Keep your children’s clothes organized for school with a simple repurposed item trick. Organizing Box Tops with a Recycled Container – How do you keep track of the Box Tops to send into school? With a recycled container, of course. Ink Pad Storage Idea – A quick trip to the thrift store yielded the perfect way to store craft ink pads. Office Paper Recycling Bin – Create an attractive way to store paper that needs to be recycled. DIY Computer Diskette Pencil Cup – This simple-to-make DIY project is a fun way to organize your desk top. Washi Tape Organizing that’s Free – Wondering what to do to organize all those rolls of washi tape? This is the perfect free and no-effort solution. Recycled Bottle Organizers – Don’t toss those plastic bottles into the recycle bin. Save them to make office organizers. 10 Recycled Office Organizers – Organize your entire office with these 10 repurposed ideas. Easy Upcycled Sweater Box – Create pretty office or craft room bins with two repurposed items you already have. Upcycled Cigar Box – Cigar boxes are the perfect size to organize office supplies and more. Repurposed Viactiv Box – The packaging from vitamins can be transformed into a desk organizer. Repurposed Tuna Box – A tuna box from the grocery store display and turn into a sophisticated storage bin. Free Craft Ribbon Storage – It’s easy to keep ribbon organized and neat with the no-cost repurposed idea. Free Portable Yarn Keeper – Keep your yarn organized and untangled while working on a project with this absolutely free idea. DIY Craft Room Organizing – You can make boring warehouse cardboard boxes into pretty organizing bins for your craft projects. Repurposed Office Organizing – A shipping box and some adhesive paper create the perfect office paper holder. DIY Dividers for Happy Planner – Keep your planner organized with dividers made from an upcycled office supply. Library Card Drawers – A quick coat of paint and an unattractive set of library drawers become a gorgeous organzing office set.